Second Lieutenant J.G. Stobart 6th Battalion attached to 4th Battalion, Rifle Brigade [the Prince Consort’s Own] was killed in action 15 March 1915 and is buried at Voormezeele Enclosure No.3, Belgium. He was 23 years old and is commemorated on the Fir Tree War Memorial, County Durham. In 1881, William and his second wife Frances Dorothea lived at Spellow Hill, near Knaresborough, North Yorkshire and he was recorded as “Magistrate & Colliery Owner & Manager”. By 1891, the family had 8 children, living at Spellow Hill, assisted by 9 servants. William was recorded as “a colliery owner and manager”. William Culley Stobart died in 1899. By 1901, Frances had moved north up to Fir Tree, County Durham and lived “on own means” at Black Hall together with 4 daughters, 2 sons including 9-year old John Geoffrey and 12 servants. John Geoffrey Stobart was educated at Aysgarth School, Yorkshire and was a member of the Yorkshire Ramblers’ Club from 1910. He attended Malvern and Pembroke Colleges, Cambridge and was a member of the Officer Training Corps [O.T.C.]. By 1911, Frances lived at Harperley Park with 33-year old single daughter Evelyn, 29-year old single Dorothy, 19-year old John Geoffrey recorded as “Student Cambridge University” and 38-year old son George Herbert and his wife Mary. George was recorded “Retired Officer, Major Royal Artillery”. There were 7 servants. The Stobart family was an influential county Durham family with coal and railway interests, developed throughout the district from the 1830’s to the 1930’s. Henry Stobart [1795-1866] J.P. was Honorary Colonel of the Durham Militia Artillery. He served in the American War 1813-15. Henry formed the company, Stobart & Co. Ltd. which was passed down to his son Henry Smith Stobart [1826-1880] and upon his death, another son William Culley Stobart [1837-1899]. Upon his death William Ryder Stobart [1864 – 1938] took over the management of the company. He was the half-brother of George Henry and John Geoffrey Stobart [see below]. The family were patrons of St. Cuthbert’s Church, Etherley and many family members are buried in the churchyard. They owned substantial properties in Etherley such as Etherley House and Red House and others in the locality such as Witton Towers at Witton-le-Wear and Harperley Hall near Fir Tree. The oldest son from William Culley Stobart’s first marriage was Major George Henry Stobart [1873-1943]. He had a distinguished military career, being gazetted in 1894 as a Second Lieutenant and rose to the rank of colonel serving with the Royal Artillery. He was 41 years old at the outbreak of the Great War and served as a staff officer, attached to the 3rd Echelon. He entered France 16 August 1914, was mentioned in despatches, awarded the DSO, gained the rank of temporary Lieutenant-Colonel in the War Office and was invested as a Commander, Order of the British Empire [C.B.E.] in 1919. He served as Deputy Lieutenant of Durham 1924 and was Commandant of Harperley P.O.W. Camp during WW2 until his death. 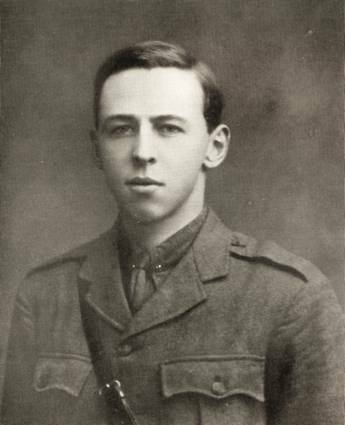 At the outbreak of war, John Geoffrey Stobart volunteered for service and was attached for a month to the 3rd Battalion, the Durham Light Infantry at South Shields pending a vacancy in the 6th Battalion, the Rifle Brigade to which he had been appointed and gazetted 15 August 1914. He was stationed with that battalion at Sheerness until 1 February 1915 when he took out a draft of men to join the 4th Battalion at the Front. 4 February: The German troops attacked the 28th Division near St. Eloi and held captured ground for several days. 14 – 15 February: Further south, the 27th Division was attacked. 21 February: The Germans blew a mine in Shrewsbury Forest, north of Klein Zillbeke thereafter constant underground fighting began in the Ypres Salient at Hooge, Hill 60. Railway Wood, Sanctuary Wood, St. Eloi and the Bluff. 28 February: the 27th Division made a successful local attack along with Canadian troops. 14 March: The Germans attacked St. Eloi after blowing 2 mines, capturing the village, trenches nearby and the Mound [a spoil heap] south of the village. The 80th Brigade fought hand-to-hand with the attackers but could not counter attack because of German artillery barrages isolating the attack front. Just after midnight 2 battalions managed to counter attack and retook the village and the lost trenches. The Mound was not regained as the Germans had managed to consolidate and retained the advantage of observation from it. Second Lieutenant J.G. 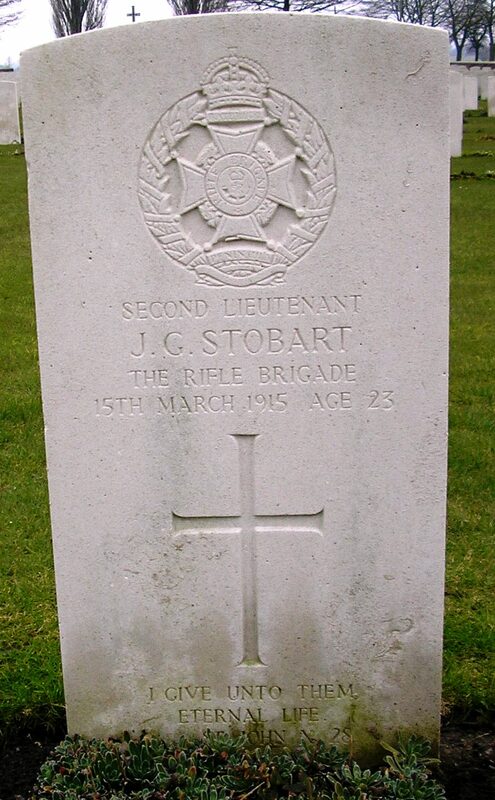 Stobart was killed in action 15 March while leading his platoon on the retaking trenches at St. Eloi. The battalion lost 2 officers and 31 Other Ranks on the 14 and 15 March 1915. Second Lieutenant J.G. Stobart was awarded the 1914-15 Star, the British War and Victory medals. Second Lieutenant J.G. Stobart is commemorated on the Fir Tree War Memorial. The 17th Durham V.A. Hospital, Etherley: 16 October 1915: The Bishop of Durham dedicated the new wing to the memory of Second Lieut. J.G. Stobart. The Stobart family offered Red House, Etherley as a Voluntary Aid hospital and Mrs. Jessica Stobart [wife of William Ryder Stobart] was the Commandant. The VA Hospital, Etherley operated between 18 March 1915 and 15 April 1919. The house was demolished to make way for a housing development in the 1950’s. St. Margaret of Antioch Church in Crossgate, Durham: A brass plaque and the organ in the church was dedicated to the men of the Parish and congregation who laid down their lives during the Great War. Remembering our Fallen: Remembering the men of Howden-le-Wear and Fir Tree who gave their lives during the Great War of 1914-1918” Howden-le-Wear Local History Society2015 p.142. 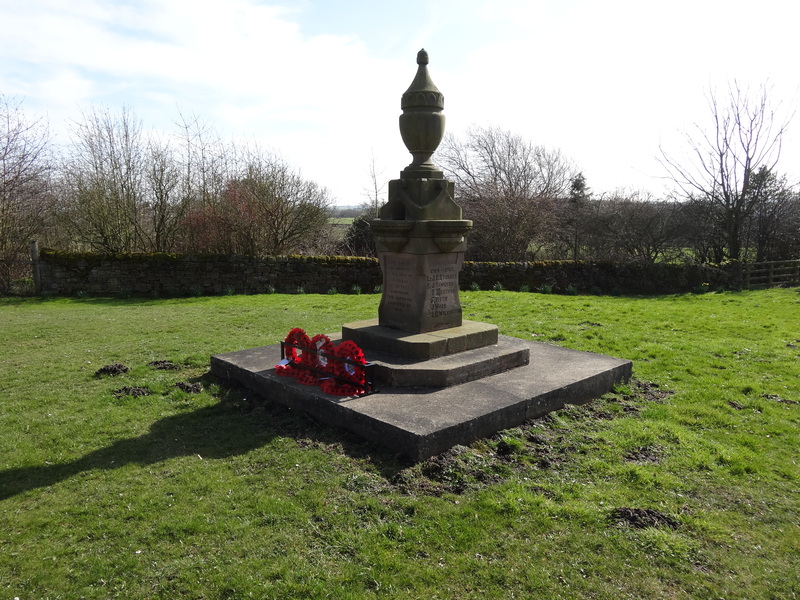 NE War Memorials Project & “Remembering our Fallen: Remembering the men of Howden-le-Wear and Fir Tree who gave their lives during the Great War of 1914-1918” Howden-le-Wear Local History Society 2015 p.143. 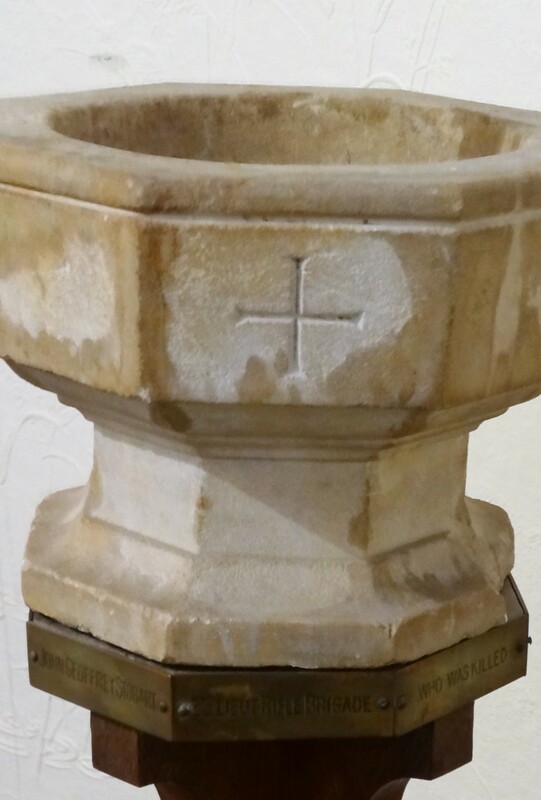 Font, formerly in Fir Tree & Howden-le-Wear churches.